S.T.Dupont Pharaoh Limited Edition Olympio Fountain Pen pays homage to the myth of ancient Egypt. Ancient Egypt was the preeminent civilization in the Mediterranean world for almost 30 centuries, from its unification around 3100 B.C. to its conquest by Alexander the Great in 332 B.C. From the great pyramids of the Old Kingdom through the military conquests of the New Kingdom, Egypt’s majesty has long fascinated archaeologists and historians from all over the world. Inspired by the codes of the god Horus, whose symbol is a crowned falcon, this awesome limited edition pen features black and red Chinese lacquer details on a gold surface, and a malachite stone inlaid in the wing-shaped clip. Medium size 18k gold nib. 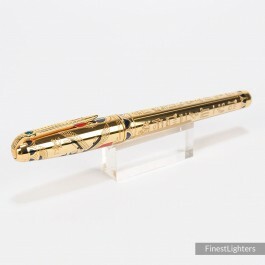 Launched in 2004, only 2575 individually numbered pieces of this pen were made, in reference to the estimated date of the construction of the first pyramid in 2575 BC. One of the most beautiful and sought after S.T.Dupont pens. Completely sold out. Please note: there is a small dent on the cap (see the last picture).